Most kids learn by example. Even when they are not quite able to communicate or express themselves, they take a lot in by sight. That is how children learn to recognize patterns, learn to read and do a plethora of other things. Children will often mimic their parents as a means of learning – after all, you are their biggest influence, especially during their earlier and more formative years. There are plenty of important things that parents should want to impart unto their children, and one of them should be maintaining good oral hygiene. As a parent, you can do a lot to help form your child’s ideas of health and wellness while also instilling them with healthy habits and other resourceful tools that they can continue to use as they get older. The first thing you can do is to lead by example. When your child is extremely young, they will not be able to hold a toothbrush on their own, let alone operate it with any finesse. 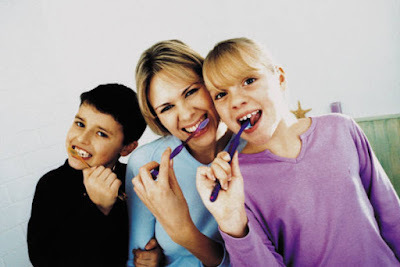 As they get older, however, it is important that you let your children try to brush their own teeth. At first, have them brush along with you. Not only will they be more willing to participate in the activity, but they will watch how you brush your own teeth and will try to emulate your habits. 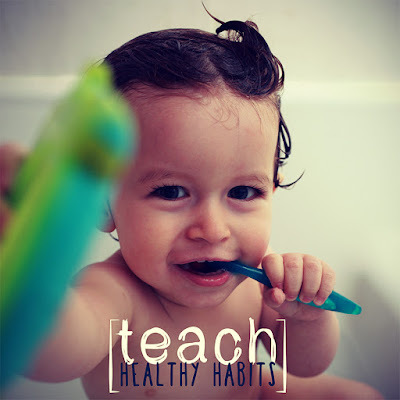 This can help teach kids how to brush as well as how important it is to brush in the first place. In general, it is recommended that children and adults brush twice a day. Brush alongside them while getting ready in the morning and before bed at night in order to instill these habits as a natural part of a daily routine. When it comes to kid’s dental care, it is also wise to help them out along the way. Make sure that you buy toothpastes that are sensitive to children’s mouths but still have healthy ingredients like fluoride that can help with mineralization, a process that helps strengthen teeth. Children’s teeth, or baby teeth specifically, tend to be small, sensitive and prone to decay and rot so it is imperative that your child brush and rinse with fluoride products that can help eliminate plaque and other harmful forms of bacteria. Eating healthy plays a huge role in dental health, as well, but this is something that you as a parent should have more control over – at least at first, anyway. The sorts of foods and drinks you prepare for and give to your child will affect their present health as well as their future health, and it can have a huge impact on the diet choices and habits that your children will have as they get older. Eating healthy, non-processed foods is a great way to help keep teeth healthy. And as you know, things that are high in sugar should be avoided or at least kept to a minimum. Kids have a known weakness for sweets, so it is important to keep a watchful eye on just how much your child eats and how often. There are so many other things that you can do and incorporate into your daily life, but one of the most important things you should be doing is scheduling routine appointments with your dentist. Adults and children alike should be visiting the dentist about twice a year for routine cleanings and general exams. Not only will a dentist be able to monitor your child’s dental health and perform any general dental services that they may need, but they can also impart some professional advice to you as a parent regarding any personal or individual needs your child may have in regards to their dental health. For more parenting tips and reading resources be sure to visit us at www.KDNovelties.com and subscribe to the KD Novelties Blog.